This page details the Player settings specific to the Android platform. For a description of the general Player settings, see the Player settings. Adaptive Set up textures for the Android Adaptive icons in your app. Round Set up textures for the Android Round icons in your app. Legacy Set up textures for the Android Legacy icons in your app. Enable Android Banner Enables a custom banner for Android TV builds. Use the Resolution and Presentation section to customize aspects of the screen’s appearance. Start in fullscreen mode Hide the navigation bar while the splash screen or first scene loads. When not set, the navigation bar appears while the splash screen or first scene loads. Preserve framebuffer alpha Enable this option if you want Unity to render on top of native the Android UI. The camera’s Clear Flags have to be set to Solid color with an alpha less than 1 for this to have any effect. (OpenGL ES only). Resolution Scaling Mode Allows you to set the scaling to be equal to or below the native screen resolution. Target DPI Set the resolution of the game screen. Unity downscales the game screen to match this setting if the device’s native screen DPI is higher than this value. The scale is calculated as min(Target DPI * Factor / Screen DPI, 1). The Factor is controlled by the Resolution Scaling Fixed DPI Factor on the Quality window. Blit Type Controls whether a blit is used to render the final image to the screen. Always (Always blit) Make Unity render to an offscreen buffer and then copy to the system framebuffer. This is compatible with most devices, but is usually slower than Never blitting. Never (Never blit) Make Unity render to the framebuffer provided by the OS. If a condition arises during application run time that causes this to fail, the application will print a one-time warning to the device log. Never blitting is usually faster than Always blitting, but it’s not compatible with all devices. Auto Make Unity render to the framebuffer provided by the OS, if possible. If a condition is met that prevents your application from rendering to the system framebuffer, the application switches to offscreen rendering and issues a warning to the device console. Set the Aspect Ratio Mode for the device. You can choose from Legacy Wide Screen (1.86), Native Aspect Ratio, and Custom. When you choose Custom, the Up To field appears. Set a custom maximum screen width with the Up To property. This property is only available when Aspect Ratio Mode is set to Custom. Auto Rotation Allow the screen to automatically rotate to any of the orientations specified by the Allowed Orientations for Auto Rotation settings. This is the default. Portrait Upside Down Permita la orientación vertical hacia abajo. Landscape Right Permita la orientación horizontal del paisaje (botón de inicio en el lado izquierdo). Landscape Left Permite la orientación landscape izquierda (botón de inicio está en el lado derecho). Use 32-bit Display Buffer Enable this option to create a Display Buffer to hold 32-bit color values (16-bit by default). Use it if you see banding, or need alpha in your post-processed effects, because they create Render Textures in the same format as the Display Buffer. Disable Depth and Stencil Enable this option to disable the depth and stencil buffers. Show Loading Indicator Select how the loading indicator should appear. The options are Don’t Show, Large, Inversed Large, Small and Inversed Small. Above the common Splash Screen settings, you can use the Virtual Reality Splash Image setting to specify a custom splash image for Virtual Reality displays. Below the common Splash Screen settings, you can set up an Android-specific Static Splash Image. Use the Android Splash Screen property to specify the texture that should be used for the Android splash screen. The standard size for the splash screen image is 320x480. Use these settings to customize how Unity renders your game for the Android platform. Auto Graphics API Disable this option to manually pick and reorder the graphics APIs from the Open Graphics Library (OpenGL). By default this option is enabled, and Unity tries GLES3.2. If the device does not support GLES3.2, Unity falls back to GLES3.1, GLES3 or GLES2. If only GLES3 is in the list, additional checkboxes appear: Require ES3.1, Require ES3.1+AEP and Require ES3.2. These allow you to force the corresponding graphics API. Important: Unity adds the GLES3/GLES3.1/AEP/3.2 requirement to your Android manifest only if GLES2 is not in the list, and the Minimum API Level is set to JellyBean (API level 18) or higher. In this case only, your application won’t show up on unsupported devices in Google Play Store. Multithreaded Rendering Enable this option to move graphics API calls from Unity’s main thread to a separate worker thread. This can help to improve performance in applications that have high CPU usage on the main thread. Static Batching Enable this option to use Static batching on your build (enabled by default). GPU Skinning Enable this option to use OpenGL ES 3 GPU skinning. To learn more about GPU skinning, see the Wikipedia page on skeletal animation. 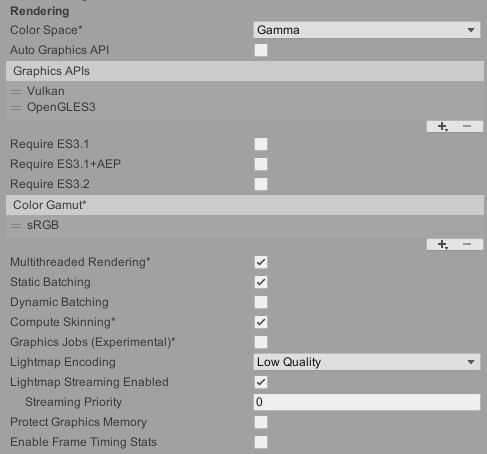 Graphics Jobs (Experimental) Enable this option to instruct Unity to offload graphics tasks (render loops) to worker threads running on other CPU cores. This reduces the time spent in Camera.Render on the main thread, which is often a bottleneck. Lightmap Streaming Enabled Enable this option to load only the lightmap mipmaps when needed. To render the current game Cameras, Unity applies this value to the lightmap textures when it generates the textures. Note: To use this value, enable the Texture Streaming Quality setting. Streaming Priority Define the lightmap mip map streaming priority when there’s contention for resources. The valid range is –127 to 128, where a positive number represent higher priority. This setting is only available when Lightmap Streaming Enabled is checked. To use this value, enable the Texture Streaming Quality setting. Protect Graphics Memory Check this box to force the graphics buffer to be displayed only through a hardware-protected path. Works only on devices which support it. Enable Frame Timing Stats Gather statistics on how much time a frame takes on the CPU and GPU. Package Name Set the application ID, which uniquely identifies your app on the device and in Google Play Store. The basic structure of the identifier is com.CompanyName.AppName, and can be chosen arbitrarily. This setting is shared between iOS and Android. Bundle Version Code An internal version number. This number is used only to determine whether one version is more recent than another, with higher numbers indicating more recent versions. This is not the version number shown to users; that number is set by the versionName attribute. The value must be set as an integer, such as “100”. You can define it however you want, as long as each successive version has a higher number. For example, it could be a build number. Or you could translate a version number in “x.y” format to an integer by encoding the “x” and “y” separately in the lower and upper 16 bits. Or you could simply increase the number by one each time a new version is released. Keep this number under 100000 if Split APKs by target architecture is enabled. Each APK must have a unique version code so Unity adds 100000 to the number for ARMv7, 200000 for ARM64 and 300000 for x86. Minimum API Level Minimum Android version (API level) required to run the application. Target API Level Target Android version (API level) against which to compile the application. API Compatibility Level Choose which .NET APIs can be used in your project. This setting can affect compatibility with 3rd-party libraries. Mute Other Audio Sources Enable this option if you want your Unity application to stop Audio from applications running in the background. Otherwise, Audio from background applications continues to play alongside your Unity application. Target Architectures Select which CPUs you want to allow the application to run on (32-bit ARM, 64-bit ARM, and 32-bit Intel). Note: Running Android apps in a 64-bit environment has performance benefits and 64-bit apps can address more than 4 GB of memory space. Split APKs by target architecture (Experimental) Enable this option to create a separate APK for each CPU architecture selected in Target Architectures. This makes download size smaller for Google Play Store users. This is primarily a Google Play store feature and may not work in other stores. For more details, refer to Multiple APK Support. Install Location Specifies application install location on the device (for detailed information, refer to Android Developer documentation on install locations. Automatic Let the operating system decide. User will be able to move the app back and forth. Prefer External Install the application to external storage (SD card) if possible. The operating system does not guarantee it; if not possible, the app will be installed to internal memory. Force Internal Force the application to be installed to internal memory. The user will be unable to move the app to external storage. Internet Access Choose whether to always add the networking (INTERNET) permission to the Android manifest, even if you are not using any networking APIs. Set to Require by default for development builds. Auto Only add the internet access permission if you are using a networking API. Require Always add the internet access permission. Write Permission Choose whether to enable write access to the external storage (such as the SD card) and add a corresponding permission to the Android manifest. Set to External(SDCard) by default for development builds. Internal Only grant write permission to internal storage. External(SDCard) Enable write permission to external storage. Filter Touches When Obscured Enable this option to discard touches received when another visible window is covering the Unity application. This is to prevent tapjacking. Sustained Performance Mode Enable this option to set a predictable and consistent level of device performance over longer periods of time, without thermal throttling. Overall performance might be lower when this setting is enabled. Based on the Android Sustained Performance API. Maximum Java Heap Size Set the maximum Java heap size to user for building (in megabytes). Defaults to 4096. Low Accuracy Location Enable this option to use low accuracy values with Android location APIs instead. Android TV Compatibility Enable this option to mark the application as Android TV compatible. 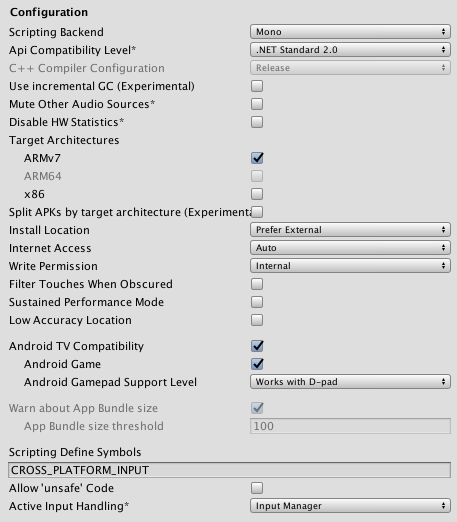 Android Game Enable this option to mark the output package (APK) as a game rather than a regular application. Android Gamepad Support Level Choose the level of support your application offers for a gamepad. The options are Works with D-Pad, Supports Gamepad, and Requires Gamepad. Input Manager Use the traditional Input window. Use these settings to customize building your Android app. Note: For security reasons, Unity does not save the passwords on this page. The unsigned debug keystore is located by default at ~/.android/debug.keystore on MacOS and %USERPROFILE%\\.android\debug.keystore on Windows. Enable the Use Existing Keystore option. Click on the Browse Keystore button and select the Keystore from your filesystem. Enter your password in Keystore password. 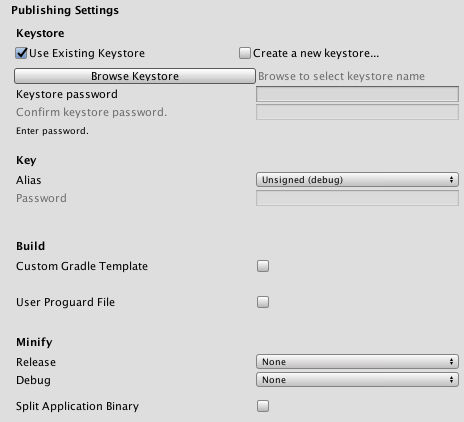 Enable the Create a new keystore option. Enter a password in Keystore password. Re-enter the password in Confirm password. Select your key from the Alias drop-down menu. Once selected, you can enter your Password. Specify whether you want to use Proguard or Gradle (Experimental) for minification, or None at all. Choose one of these options from the Release and Debug drop-down menus. Enable the Split Application Binary option to split your output package into main (APK) and expansion (OBB) packages. This is required to publish applications larger than 100 MBytes to Google Play Store. Enable Use Legacy SDK tools to use the deprecated Android SDK build tools to build the app. Selecting this option can increase build times. Single Pass Multiview or Instanced (Preview) Render both eye images at the same time into one packed Render Texture. This means that the whole Scene is only rendered once, which significantly reduces CPU processing time. ARCore Enable this option to use Google’s ARCore platform.